Above: The wing of the plane from my window! This week, I traveled to Florida with my husband; since were were only going to be gone for five days, I committed to a challenge that, up to this point in my adult life, I have never accomplished...bringing only carryon luggage. Naturally, the first fear I had involved how I would be able to condense my skincare and beauty products (let's save that for another post!) into such confines. A new time zone, different climate and a wealth of business events...is it even possible to pare my arsenal down to the bare minimum? Fortunately, I am in possession of some incredible multi-tasking products...from the most luxurious splurge to the extremely affordable, this 12-item eclectic collection travels well and works even better! Above: The Chantecaille Gold Energizing Recovery Mask comes in individually sealed single-use packets. 1. Chantecaille Gold Energizing Recovery Mask: After getting but three hours of sleep the night before embarking on my journey (packing effectively, I'm afraid, takes me an inordinate amount of time), I awoke at 5:30 AM to itchy, tired, horridly puffy eyes and promptly shuffled to the refrigerator (I can thank Chantecaille Regional Artist, Greg Velasquez for this tip) to procure one of these eye masks. Drenched in active botanicals, these gel strips quickly adhere to the orbital region to tend to eyes in distress. 20 minutes later, my eyes looked human. Since each slim, disposable set is individually packaged, I slipped a couple more in my bag for reinforcement. Above: 10 oils + 10 uses = amazing. A single product with this many benefits and purposes is a non-negotiable when faced with the need to pack lightly! Above: Steam Cream...lovely and effective. 3. Steam Cream: I tossed the springtime edition of Steam Cream (also reviewed HERE) into my carry on without hesitation. This vibrant, secure tin houses a lush cream formula that makes my arms and legs endlessly smooth. It is diminutive enough to fit in the smallest bag but concentrated enough to take care of your body's hydration needs for days! Above: This Air Repair kit is your carryon's best friend! 4. Air Repair Travel Kit: All five components of this magnificent, carry-on-friendly set (also mentioned HERE) are designed to keep skin hydrated and balanced over the course of air travel, which, of course, is infamous for being as arid as a desert. It includes an eye cream, cleansing milk, facial mist, moisturizer, and all-purpose skin salve for a visage that is impervious to the stressful and drying environment of the airplane cabin. Above: One spritz and I feel alive again. I especially like the Complexion Quenching Facial Mist which provides me with an immediate refreshing sensation when spritzed on the skin. It is light, invigorating and keeps my face hydrated without disrupting my makeup. I'll be hosting an Air Repair giveaway in early April so keep your eyes peeled! Above: Tanee...sunless tanner and a tinted bronze wash of color in a single pen. 5. The Tanee Tan Line Corrector: This all-natural product is relatively new to me but I figured its pen-like size was perfect to bring along, just in case I need to combat some unwanted tan lines from the intense Florida sun. Above: The felt-tip applicator of the Tanee. I experimented with it before leaving and can attest to the fact that it words like a tinted-sunless tanning formula...one sweep of the felt tip and the tan line is diminished by a sheer bronze tint. Over the next couple of hours, the sunless tanner develops, furthering the camouflage effect. I'll never be without this on subsequent tropical vacations...it's a tiny must! Above: Tangle Teezer...where have you been all my life. 6. The Tangle Teezer: I have extremely long, thick hair that tangles easily (generally due to my purse straps and overall lack of interest in brushing it). In turn, I lament about my tangles constantly. When I encountered the Tangle Teezer last week, I was intrigued by its claims of eradicating tangles painlessly. $16 later, the Tangle Teezer became mine. Imagine my sheer delight when I discovered that the Tangle Teezer truly lives up to its claims. The light, flexible bristles glide through my hair with ease (even when its wet!) and add layer upon layer of smoothness until every last section is detangled. Above: The bristles are deceptively effective. This brush is essential for anyone who detests tangles and the fact that it is lightweight and palm-sized makes it a perfect travel companion as well. I'll try to do a video with this brush soon! Above: Dr. Sponge...all natural skincare for cleansing. 7. Dr. Sponge Original: Since I had so little space in my bag, I resigned myself to the fact that I couldn't bring my Clarisonic. In turn, this trip has been a key time to try out a new product, the Dr. Sponge Original. Made of Konjac, this sponge cleanses and gently exfoliates with and without soap. Above: My Dr. Sponge Original before getting wet...once drenched in water, it becomes much softer and more plump in nature. The brittle exterior softens and expands once it absorbs water and my skin is left clean and balanced. I am completely impressed by this natural wonder and am glad that it makes such a fantastic (and compact!) travel companion. Above: Swipe...deodorant on the go. 8. Swipe Single Use Deodorant Wipes: These towelettes are invaluable when in the midst of travel and the fact that they are no larger than a matchbook allows me to toss a few into my bag with ease. For moments when your deodorant might of lost its efficacy, tea tree extract infused Swipes provide long lasting protection against perspiration and odor. Above: The gorgeous Jenny Patinkin All-Over Face Brush. 9. The Jenny Patinkin Lazy Perfection Brushes: At home, I love having all of my favorite makeup brushes at my disposal. This luxury, however, is not as realistic when traveling. In turn, I decided to bring two (not 20!) of the most versatile brushes in my collection. The extremely well-crafted Jenny Patikin All-Over Face Brush is brilliant for applying foundation, bronzer, blush, powder and contour. The bristles are ridiculously soft, yet strong enough to apply product in an expert manner. Above: This brush is your concealer's perfect companion. I've mentioned the beauty that is the Domed-Multi Blender Brush in a recent video. This dense bristles work so very well with cream and powder concealers, allowing the product to blend seamlessly with your skin. I cannot be without it! 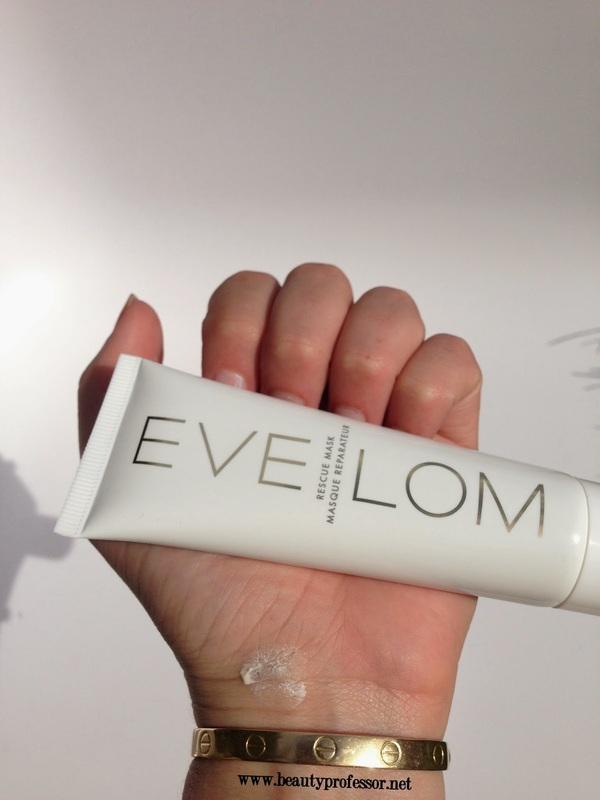 Above: A swatch of the Eve Lom Rescue mask on my wrist. 10. Eve Lom Rescue Mask: Whenever my skin feels stressed (which invariably happens with traveling), this Rescue Mask works miracles. The white clay has a slight tingling effect that is simultaneously relaxing and refreshing and one 15-minute session and my skin is calmer, clearer and more balanced. The tube is conducive to travel and formula works on all skin types, including my excessively sensitive visage! 11. 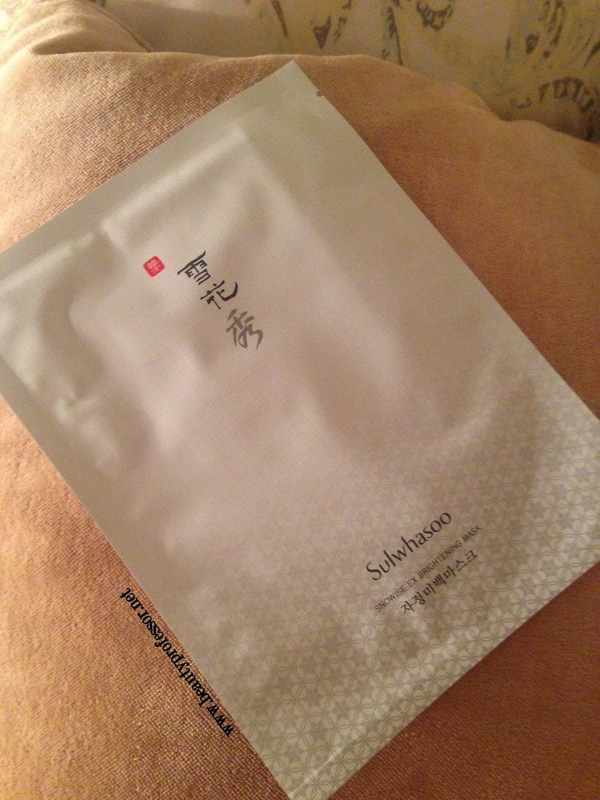 Sulwhasoo Snowise Ex Brightening Mask: This product is my first foray into the ever popular sheet masks genre and I must say, I am impressed. Individually-packaged in streamlined envelopes, the patented mask is created from plant pulp and is fermented in white ginseng for 2 weeks. I adore using this before an evening out to freshen up and restore life to my face after a long day of meetings or sightseeing in the elements. Above: The mask in action. It may look a bit troubling but I daresay, this Snowise Mask is relaxing and entirely efficacious in creating smoother, more hydrated and brighter skin in a flash! Above: Two flights, one layover and eleven hours later, fresh off of the plane and ready to head to our hotel. Bottom Line: Packing lightly for a trip can be a trepidatious endeavor, especially for a chronic overpacker like me. I hope you enjoyed this product rundown and would love to hear about your travel favorites! Have YOU tried any of these carryon-friendly items? *Some items mentioned are PR sample provided for review (the rest purchased by me) , however, as always, all of my opinions are expressly and unequivocally my own. This post contains affiliate links; my disclosure policy contains additional details on how these work. Please try one of the Talika sheet masks, they are great! Even on a weekend Euro trip, I am not able to take only carryon luggage with me. Thanks for the Talika tip and kind wishes from Germany! Glad to know I am not the only one who struggles when it comes to packing lightly! Having traveled myself with only a carry on bag, I can appreciate the thoughtfulness needed in doing this while still managing to include "essentials". Aren't they all, really? Each product serves a vital purpose in MHO. My question is in regards to the TF traceless foundation stick...your swatches and review was impeccable. I am wondering if you feel this foundation is worthy of the large price tag. I am close to finishing some of my foundations and need to purchase just one and use it until it alone is done. I know...not something I am used to. Your opinion is valuable to me. I can justify the cost if it it is a good formula that will work on my aging near 50s skin. I seek a medium covetage. Your time is most appreciated! With regards to your question about the TF foundation stick, I do believe that it is the best foundation stick on the market right now (and I have tried a lot of foundation sticks!). It is expensive but a little goes a long way and it will last you forever. It has medium coverage and can be buildable to full with very respectable lasting power. I suggest using a nourishing primer first and then buffing the TF stick on with a damp beauty blender...I suspect you will love the results! I hope that helps...xoxo and keep me posted! I don't travel often anymore but my favorite place ever was going to Paris and then the south of France. My next trip will most likely be related to The Makeup Show since I've never been. I always bring my Aquis towel, put my cosmetics in my Hold Me bag and bring along reading material galore. Hello Marcia, my Lipstick Twin! How lovely to hear from you...ahh...the South of France. It's always been a place I've wanted to visit. Someday!